The man who used to run the local homewatch used to say that one of these would be perfect for keeping burglars away! Whilst a radio is only audio, this device actually pretends to be a TV. Everyone knows you only have a tV on when someone is in the house and so this FakeTV Burglar Deterrent Device is perfect for keeping the burglars away! 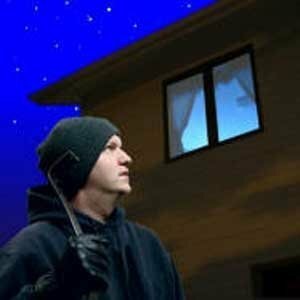 The FakeTV Burglar Deterrent Device is available to buy now and whilst it's nearly £27 in price, it's probably one of the most effective anti-burglar deterrents there can be! The Fake Television is really clever and will change the light to simulate scene changes, light fades, light flickers, on-screen motion and colour changes so it looks just like someone is watching a real television. Burglars know that breaking into an occupied house and confronting a person massively increases the risk of him being caught and it also increases the seriousness of the offence and hence the prison sentence if they are caught. Using FakeTV could not be simpler, just place it in a room near your closed curtains and the burglar will see the constantly changing light around the edges of the curtains. Plug the FakeTV into the mains electricity using the included adapter and the built in light sensor will turn FakeTV on at dusk for 4 or 7 hours, so there is no need for an external timer. This is incredible! It uses less energy than the TV would being on, doesn't need a timer and is a brilliant idea! Just what the homewatch man suggested in fact!